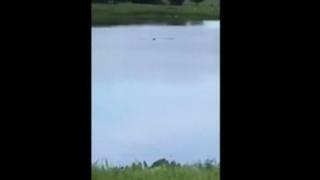 It is a harrowing video to watch: a man, crying out for help as he struggles to swim in the middle of a Florida pond. Off camera, the voices of five teens, mocking him. "They drowning, what the heck," one laughs. "Ain't nobody fixing to help you," another is heard to say. And, after his head disappeared under the water for the final time: "Oh, he just died." The body of Jamel Dunn - a 32-year-old disabled father-of-two - was found in the water three days later, on 12 July. Up until that point, no one knew where he had gone. No one had called 911 to report a man in trouble. No one even knew anyone had witnessed the drowning until the video emerged on social media, and Dunn's family members saw it. Its contents have shocked the community in the city of Cocoa, on Florida's east coast. But the teens, aged between 14 and 16, will face no charges, prosecutors have said: there is nothing on the statute books which deal with an incident like this, they say. The vast majority of states in America do not put a "duty to rescue" on their citizens, but 10 do. But even these do not cover all instances. Florida is one of the few states to have such a law, but it only covers reporting a sexual battery if witnessed or suspected, according to The Volokh Conspiracy, a blog written mainly by law professors. In fact, only a few countries in the world have a law which means people have to help or risk prison time, including Germany, where four people are currently being prosecuted for "unterlassene Hilfeleistung" (failure to provide assistance). According to local reports in Germany, last October an 82-year-old man collapsed in a bank in Essen, but was then ignored by other customers, ranging in age from 39 to 62, for the next 20 minutes. A fifth customer eventually called an ambulance, but it was too late, and the man died a few days later in hospital. No-one in the case has been named. Perhaps the most high-profile instance of a law like this involved the death of Princess Diana. Seven photographers were accused of failing to render assistance by French investigators following the 1997 Paris crash which killed the princess, her boyfriend Dodi Al-Fayed and driver Henri Paul. The men had taken photographs rather than helping the dying occupants of the car, it was alleged. But after two years of investigation, all charges were dropped against them. But why would you have such rules? Surely people should help simply because it is the right thing to do? Sometimes, however, people are more worried about being landed with a bill - or getting into legal trouble. In China, that fear is so strong that when a two-year-old girl was struck in a hit-and-run accident in the city of Foshan, Guangdong Province, 18 people ignored her before one person stopped to help. Image caption Wang Yue, two, is seen on CCTV before being hit by a vehicle. Wang Yue, who was nicknamed "Little Yueyue" by Chinese media, later died in hospital. The case sparked a national debate about China's morality, one which reared its head again this year, when a woman was struck by a car but then ignored by pedestrians crossing the road moments later. But many social media users understood the decision, according to the New York Times. "If I helped her to get up and sent her to the hospital, doctors would ask you to pay the medical bill," one wrote. "Her relatives would come and beat you up indiscriminately." The teenagers in the Florida case, however, would not have ended up in trouble. Every state in the US has a "good Samaritan law", which largely protects those who try to help in an emergency situation from being sued. But whether or not this factored into their thinking is unknown. The teens were heard to mention alligators - but that would not have prevented them calling 911. As for the moral argument, Yvonne Martinez, the Cocoa Police Department spokeswoman, told Florida Today at least one of the boys did not seem worried by the implications of what they had done. "There was no remorse, only a smirk," she said.